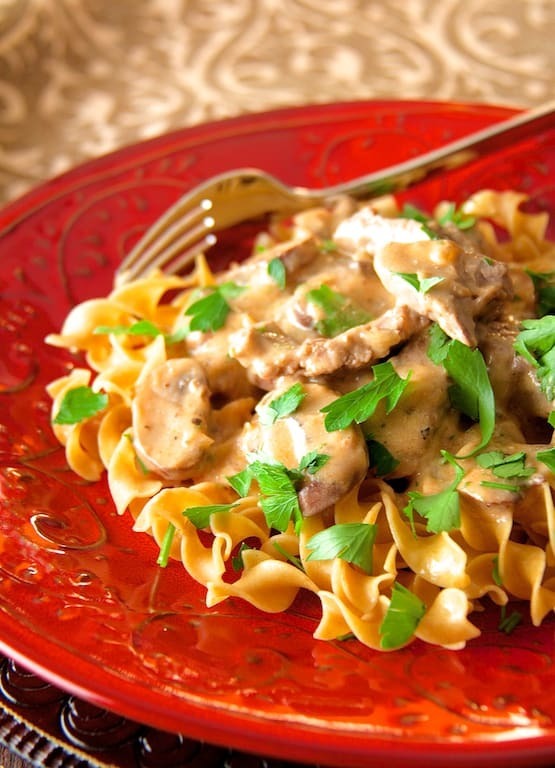 Beef Stroganoff is a rich and luxurious dish with aristocratic origins. This lightened-up version, scaled for two servings, makes it perfect for today. Heat 2 teaspoons oil in a non-stick skillet over medium-high heat. Season beef tenderloin strips with salt and black pepper. Add beef to skillet and brown 1-2 minutes per side. Transfer to a plate. Add 1 teaspoon butter to pan. Add the mushrooms and brown, stirring often until softened and browned, about 2-3 minutes. Transfer to plate with beef. Add remaining oil and butter to pan then add onion, reduce heat to medium-low and cook 3-4 minutes, stirring often or until softened. Stir in flour and cook 1 minute. Add wine, stir, then slowly add chicken and beef broths along with tomato paste, whisking constantly. Bring back to a boil and cook 3-4 minutes or until thickened. Reduce heat to low. Place sour cream in a small bowl. Remove approximately 1/2 cup of the hot liquid and whisk into sour cream in increments then transfer back to pan along with beef and mushrooms. Heat through and stir in half the chopped parsley. Serve over egg noodles. Garnish with chopped parsley.